ALEXANDER, RICHARD HENRY, businessman; b. 26 March 1844 in Edinburgh, son of James Alexander and Elizabeth Scott; m. 1 Feb. 1867 Emma Helen Tammadge in Victoria, and they had three sons and one daughter; d. 29 Jan. 1915 in Seattle, Wash.
R. H. Alexander’s father, a wine merchant, brought his family to Toronto in 1855, and established himself in the same trade. In Scotland, young Richard had been educated at Edinburgh Academy, and in Canada he attended Upper Canada College and the Model Grammar School, from which he graduated in 1860. He left the University of Toronto to find work in Upper Canada when his mother died and his father returned to Scotland. In 1862, lured by stories of the Cariboo gold-rush, he joined a party of Overlanders, heading across the continent to British Columbia. After an arduous seven-month trip, in which one of their number was lost in the Fraser River, Alexander and his three remaining companions arrived in New Westminster. Alexander did odd jobs in New Westminster and in the Cariboo until August 1863, when he went to Victoria; there he found work as a longshoreman, and later as a clerk. In 1870 he was hired as a storekeeper by the Hastings Mill Company, which was operating on the future site of Vancouver. He was promoted to accountant, and in 1882 to manager, a position he held until 1914. In the early years, he was responsible for a workforce “very largely composed of run-away sailors and Indians,” with Chinook Jargon the normal language used, as he later recalled. When Alexander had arrived, the mill was owned by Heatley and Company of London, England. By 1887, with the coming of the Canadian Pacific Railway to Vancouver, the mill property, being adjacent to the line, became extremely valuable. Heatley and Company sold out to a Victoria-based syndicate, which organized the Hastings Saw Mill Company Limited. In 1889 this syndicate sold the operation to John Hendry’s Royal City Planing Mills Company Limited of New Westminster and Vancouver. The two firms were combined in the British Columbia Mills Timber and Trading Company, soon to be the largest lumber company in the province. Alexander became secretary, with Hendry as president. In 1891 Alexander, the “local manager,” was living near the mill, at 300 Alexander Street. Under his direction, the Hastings mill was the dominant sawmill, and was one of the major businesses in the booming city. By 1891 it could produce up to 160,000 board feet of lumber per ten-hour shift. About 150 men worked in the mill, and the same number in the logging camps supplying it. With the coming of the CPR, the plant had started shipping to the prairie market, but it still emphasized the export trade. Alexander travelled extensively in Europe and South America to maintain those markets. When the plant burned in 1898, it was rebuilt with greater cutting capacity. In 1911 the Hastings Saw Mill remained the core of B.C. Mills, representing almost two-thirds of the total value of the company’s assets. Although he retired in 1914, Alexander remained involved in the mill until his death. His only other commercial activity was in the insurance business; he had been in “earlier years” the Lloyd’s of London agent for the British Columbia mainland, and in 1890 a director of the Pacific Coast Fire Insurance Company. As a pioneer of Vancouver, Alexander had been active in community development. He was involved in the first post office and the first school, and was chairman of the first board of health, a justice of the peace, and chairman of the Vancouver Pilotage Authority. He supported Vancouver’s incorporation and ran for mayor in the first civic election in 1886. His defeat by Malcolm Alexander MacLean* was seen as a victory of the new “Canadian” society of Vancouver over the old “British” culture which Alexander represented. 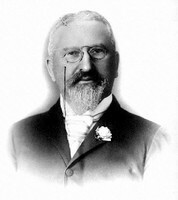 Elected to city council the following year, Alexander served until 1889 and then chaired David Oppenheimer*’s campaign for re-election to the mayoralty. In 1887 Alexander had helped establish the Vancouver Board of Trade, and he later spent two years as its president. He served for a time after 1895 as the Peruvian consul in Vancouver, and was the first president of the Vancouver Merchants’ Exchange in 1914. He was involved in several lumber industry organizations, including the Pacific Coast Lumber Manufacturers’ Association and the British Columbia Lumber and Shingle Manufacturers Association Limited. Around 1910 he was active in the Canadian Manufacturers’ Association. A social leader of the community, Alexander was a mason, a member of the Ancient Order United Workmen, and an organizer and founding member of the prestigious Vancouver Club. His avocation was sailing, and he was the commodore of the Royal Vancouver Yacht Club in 1906 and 1907. Politically conservative and an “ardent imperialist,” he took part in the work of the Imperial Federation League. He died in Seattle in 1915 while visiting a son. Over the course of his career Alexander participated in many of the key events in the development of British Columbia and Vancouver. Even in his own lifetime, he was recognized as a transitional figure connecting the heroic past of the gold-rush and the frontier to the modern world of industry and urban centres. Alexander’s account of his 1862 journey to British Columbia has been published as The diary and narrative of Richard Henry Alexander in a journey across the Rocky Mountains, ed. Neil Brearley (Richmond, B.C., 1973); the manuscript diary and narrative are preserved in BCARS, E/B/AL3.1 and .3 respectively. Alexander’s publications also include a 1906 address to a Vancouver forestry convention, printed under the title “Early days of lumbering veiled in obscurity,” in the Western Lumberman (Vancouver), 16 (1919), no.10: 63–64, and “Reminiscences of the early days of British Columbia,” in Canadian Club of Vancouver, Addresses and Proc., 1910–11: 9–18. BCARS, E/B/AL3.2A. City of Vancouver Arch., Add. mss 27 (Hastings Saw Mill Company, letter-book, 1870–74); Add. mss 46 (William McNeill papers); Add. mss 538 (Hastings Saw Mill Company papers, 1899–1905). Univ. of B.C. Library, Special Coll. and Univ. Arch. Div. (Vancouver), M290 (Hastings Saw Mill records). J. B. Kerr, Biographical dictionary of well-known British Columbians, with a historical sketch (Vancouver, 1890). R. A. J. McDonald, “Business leaders in early Vancouver, 1886–1914” (phd thesis, Univ. of B.C., 1977); “Vancouver’s ‘four hundred’: the quest for wealth and status in Canada’s urban west, 1886–1914,” JCS, 25 (1990–91), no.3: 55–73. Alan Morley, Vancouver; from milltown to metropolis ([2nd ed. ], Vancouver, ). Scholefield and Howay, British Columbia. G. W. Taylor, Timber: history of the forest industry in B.C. (Vancouver, 1975). Jamie Morton, “ALEXANDER, RICHARD HENRY,” in Dictionary of Canadian Biography, vol. 14, University of Toronto/Université Laval, 2003–, accessed April 26, 2019, http://www.biographi.ca/en/bio/alexander_richard_henry_14E.html.